One of the region’s premier wineries and an award-winning wedding venue, the Zonzo Estate restaurant serves up authentic share-table Italian cuisine among 45 acres of vineyard. They released their 2015 wine variety in 2016, this relative newcomer to the Yarra Valley has quickly become a superstar of the region. 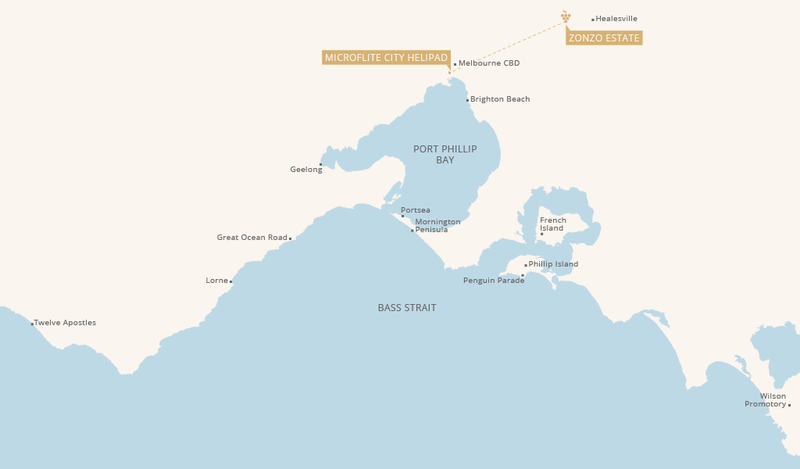 See the sights of the city, surrounding suburbs and world-class wine region as you fly from our Melbourne CBD helipad to this world-class location. When you arrive, you and your guests will enjoy a five-course Italian feast that includes canapés, antipasto, wood-fired pizzas, roast, dessert and drinks. No availability? Please call our Client Services team today to check availability. Not available Monday & Tuesday. Wednesday to Friday lunch sitting: 12:00pm to 2:00pm. Saturday & Sunday lunch sitting: 11:30am to 1:30pm. If you would like to make a booking for 19+ passengers please contact our office on (03) 8587 9700. Tour bookings are essential. All flights are subject to availability, confirmed passenger weights and weather. Please refer to our Policies for a full list of conditions. To check availability or to make a reservation, contact Microflite or book online. Do you have an infant (under 3 years old) travelling with you? Design your perfect experience with Microflite. Explore exciting options for destinations, bespoke flights, accommodation, and amazing adventures.